Thank you for using our Online Application Process. Please be aware this is only an invitation to apply for USBA life insurance and is not a guarantee of approval of coverage. Coverage for yourself and/or any dependents is not effective until approved by USBA and New York Life. Need joint coverage for you and your spouse? Need More Information before applying? Click here to request a Free Info Packet on any of our life insurance plans! Answering the following questions will help determine whether or not you qualify for insurance with USBA. It does not in any way indicate whether or not your application will be accepted and insurance granted to you. We’ll send you an email with your information right away, save it so you can login again later if needed. USBA Associate Member Help. A USBA Associate Member is either a spouse or eligible child age 18-22 of someone who is eligible for USBA membership. (Note: your spouse or parent does not have to be insured for you to be an Associate Member, they just need to be eligible). -- Select One -- Full Time Active Duty Retired Federal Employee Federal Credit Union Member Honorably Discharged Veteran Reserves - Full Time Reserves - Part Time National Guard - Full Time National Guard - Part Time I.R.R. Yes, I’d like to retrieve information from my USBA profile to help fill out my online application (you’ll need to enter your Member Service Center user ID and password). IMPORTANT: If you are working with an agent, you have been provided with an agent number to use on this application. Please enter the number in the field below. If you are working with an agent, and do not have the agent number to enter here, contact your agent so you can enter the number below before proceeding. USBA is a nonprofit organization providing a variety of low-cost group life insurance plans and other financial services. USBA programs are specifically designed to meet the special needs of Active Duty and Retired members of the Military, Honorably Discharged Veterans and Federal employees. As such, USBA can only offer insurance to people who meet specific requirements. Applying online is not currently available in Massachusetts or New York. Residents of Massachusetts or New York may hit the ‘Back’ button on your browser and select ‘Download Application’ then print and mail an application to USBA. USBA Smart Value 10 Year Group Level Term - Not available in New York. 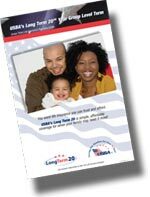 USBA Long Term 20 Year Group Level Term - Not available in New York and Washington State. USBA Fifty Plus Group Whole Life - Not available in Washington State to members age 65 and over.